The world asked Kerchair, “Why?” and they just responded with, “Why not?” Why not, indeed, make a neck pillow in the shape of cooked and peeled shrimp? For some reason, it’s extremely uncomfortable being around someone who’s wearing this, but it offers extreme comfort to the wearer. The shape and plush materials allow for proper neck support for when you fall asleep in public, and the full-wrap-around-your-neck design helps with catching any stray drops of drool while you slumber. 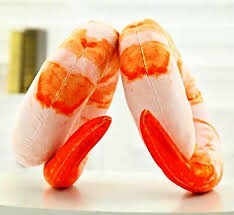 Not only are they neck pillows but these shrimps can also be used as emergency throw pillows for when you need to keep your couch and house looking fancy. You may hate them at first, but as time goes by you’ll find yourself feeling indifferent about them.